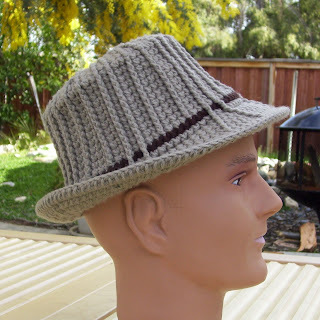 After seemingly unending modifications, I've finally finished the pattern for my Unisex Ribbed Fedora. Sizes available for Toddler/Youth (18-19 inches), Small Adult (20-21 inches, and Large Adult (22-23 inches). As many of you know, I'd rather crochet than write patterns, but I've had so many requests for this pattern, I felt I'd better get something out there or I'd lose some credibility. This hat is now the hat I wear everyday. I've had many nice comments from people I meet. The shape of the brim and crown shape is maintained by nylon line - you know, the kind that is used in lawn edge trimmers. Thanks! So far, this is my favorite hat. I wear it everyday. how can i get this pattern, i love it! I just purchased your hat. I am going to try making it in a bamboo silk from Paton but it is a 3 weight and a bit soft so it may not work well. I will go to my worsted stash.. Caron taupe or cream if need be. 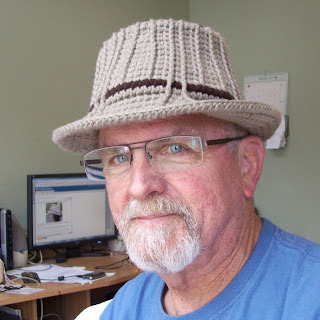 I am bald right now from chemo and been wanting a hat I could main in a neutral color and a way to add a band in the color matching my outfits. I want it in cotton blend so I may try that as well. 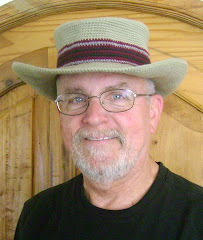 I am in AZ and we don't need hats so much here. This is exactly what I am looking for and I am really excited about trying it. I will let you know when I get done. I'd love to do this hat for my new grand daughter's (1 week old) photo shoot but unfortunately I can't afford right now. Anyway, your hat is awesome and I hope to purchase soon. Congratulations on your new granddaughter! Hello! I am working on your wonderful pattern for a friend to give as a gift.